If I were Honda or Toyota I would be afraid, very afraid of Kia. Every new Kia is better than the previous, and they maintain their price edge over the competition. 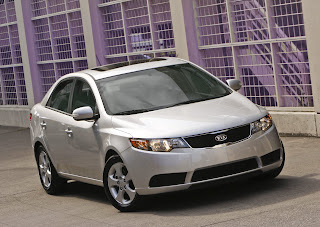 The Kia Forte is the most recent example. The Forte is clearly aimed at the Honda Civic and Toyota Corolla. It is a compact, front-wheel-drive four-door sedan (a coupe, spelled Koup, is available) that undercuts both the Civic and Corolla on price. A base Forte lists for $13,695; the least expensive Civic is $15,505 and the Corolla is $15,350. No longer does a Kia model look like someone's poorer cousin. The Forte is an attractive package. To my eye there is a look of sporty elegance. As soon as I got in the Forte I was impressed - nothing looked or felt cheap. When I drove off I was amazed - this is one nice driving car. Two engines are available, a 2.0-liter and a 2.4-liter 4-cylinder, both have more than ample power (156 and 173 hp respectively). I drove a Forte EX with the 2.0-liter and a 4-speed automatic and it was sweet. The EX is a very complete package - just about all the options you'd like included in its base price of $16,795 except for a leather package ($1,000) and sunroof ($800). Fuel economy is rated at 25-city and 34-highway. A Forte SX with the big engine and 6-speed manual transmission is rated at 22 and 32, still pretty decent. Add in Kia's 10-year/100,000-mile limited powertrain warranty and 5-year/60,000-mile 24 hour roadside assistance, wow! I have absolutely no problem recommending a new Kia to friends and family.